There is a certain irony in an AB-Inbev brewery recreating a 19th century beer that demonstrates how wildly inaccurate craft IPAs are from a historical perspective. 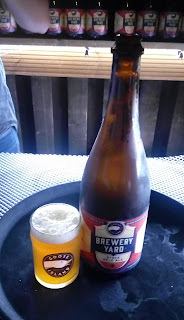 But that is what Goose Island’s one-off Brewery Yard Stock Pale Ale does – although if you look at it another way, it is also bang in line with modern craft beer fashions, being both barrel-aged and secondary-fermented with Brettanomyces. Irony indeed! Based on an 1877 Trumans recipe for a Pale Ale from Burton-on-Trent, Brewery Yard seems about as authentic as you can get using modern ingredients. Mike used floor-malted English barley, plus English Goldings and US Cluster hops – American hops were widely used in Britain in the 1800s, but for bittering and their preservative value, not for their flavour which was generally disliked. In the absence of the neutral Memel oak barrels that 19th century brewers preferred, he took Bourbon barrels that had already been used for beer twice, so most of the whiskey character was gone, and steamed them thoroughly. So was it worth the wait? From the drinker’s perspective, very definitely so. The first thing you notice about the beer, apart from its golden-brown colour and initially fluffy head, is a characteristic Bretty aroma – tart and almost fruity, reminiscent perhaps of ascorbic acid. Then there is a potent dry bitterness with herbal notes to it, and a tart woody winey palate. It really is fascinating – and worryingly drinkable for something that weighs in at 8.4% ABV! Ron reckoned it was also quite possibly the most expensive beer Goose Island has ever done – its Chicago brewery is a 50-barrel (almost 6000 litre) plant, but by the time all the losses in the process were accounted for, there only about 20 barrels left. Of that, just over 2000 litres made it into 75cl bottles, and 600 of those have come to the UK (where they’re priced at £20 each). As well as losses in the barrel-ageing, a huge amount was lost during hopping – Brewery Yard used whole-leaf hops, which the brewkit was not designed for, and a lot of wort was left in the wet hops afterwards. 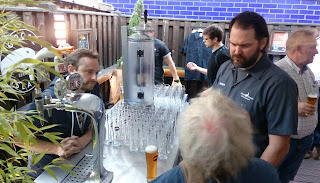 It’s great that Goose Island is still able to do projects like this, even if, as one of the other guests at the launch (brewer and Brett expert Ed) pointed out they’ve perhaps played it a bit safe by using Brettanomyces Claussenii, which is one of the subtler Brett strains. And of course one reason they have the capacity for projects like this and their sours at Fulton is that their main brands such as Goose IPA, 312 Urban Wheat and Honkers are now produced at massive east and west-coast breweries belonging to their parent company, AB-Inbev. The financial weight of AB-Inbev is also behind Goose Island’s push into the UK. The Brewery Yard launch was part of this, but so is the UK edition of its Block Party series tomorrow in Shoreditch – basically an afternoon of live music, with bars and food stalls – and so too was the appointment last year of a European brand ambassador, Josh Smith, who was formerly at the White Horse on Parsons Green. “We don’t want to send beer over with no support – the storytelling and training is a big part of it,” Josh explained. 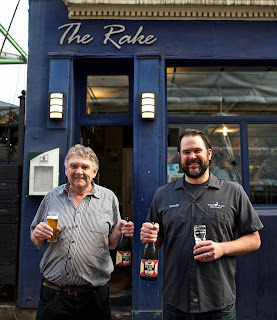 He added that, unlike US brewers who’re brewing in Europe, Goose will continue to bring its beers in from the US. He explained it’s all about the logistics – an area where AB-Inbev has been a big help – with the beer being shipped and stored chilled all the way. As well as introducing Four Star Pils and Green Line Pale Ale to the UK this month, Josh is keen to get 312 Urban Wheat as a regular on draught – he sees it as a good crossover or gateway beer for lager drinkers – and on bringing Goose’s seasonals in too. 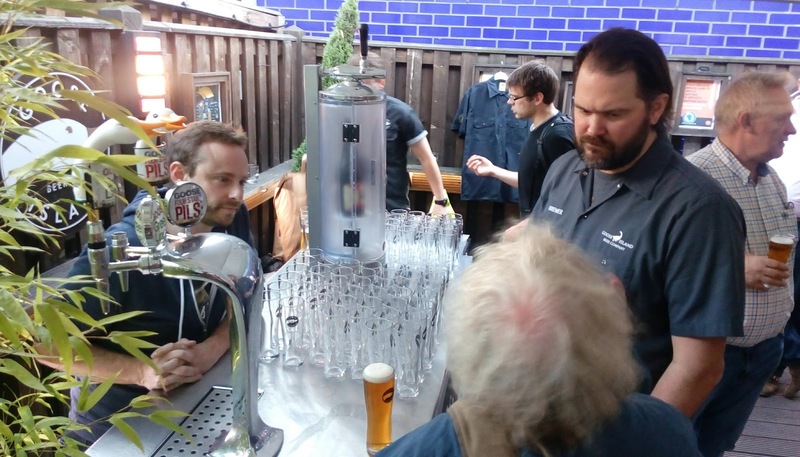 In the battle for the soul of craft beer, it really is 'interesting times'! Nice write up and good to see you again (cluster not cascade though). Oops. Now fixed - thanks for that. And good to see you too sir! I'm sorry I missed this. Oddly I was invited, but I was, ironically, in Amsterdam!